After the Big Four, one of my favorites in the thrash genre as a teenager would be Testament. Headbangers Ball played the video “Over the Wall” off their debut album The Legacy and most metalheads were all in through Chuck Billy’s chilling, melodic delivery and screams as well as the intensity of the riffing, plus the technical, intricate solo abilities within future axe hero Alex Skolnick. They went on the tour/album/tour rollercoaster through 1987-1991, rising up to opening large arena shows in North America on the Judas Priest Painkiller tour with Megadeth by the time the very rushed/half-baked Souls of Black hit the marketplace. Even during the 1990’s when metal’s status plummeted stateside, albums like Low and Demonic proved that the band weren’t intent on resting on the past- pushing forward and embracing new, heavier/modern death/black influences while still maintaining a level of quality other bands abandoned. Now reveling in the revival of the genre (in part resurrected due to a Thrash of the Titans cancer benefit for Chuck 15 years ago), the tenth studio album Brotherhood of the Snake keeps Testament chugging along with that attacking nature – noncompromising and attune to what most of their followers desire from the group. Given the natural desire for media support and requests, guitarist Eric Peterson handled our limited time professionally as we tackle new album talk, the stunning cover art, thoughts on the band’s live performance outlook given today’s technology advances, and the competition for attention given the number of bands and outlets today versus the band’s start over 30 years ago. Dead Rhetoric: Brotherhood of the Snake is the newest Testament album. What was the mindset going into the songwriting and performance aspects of this recording? Eric Peterson: The mindset…I guess writing a new record. We didn’t really have a title before we started writing so basically we wanted to continue on the path of what we’ve been doing in the 2000’s. 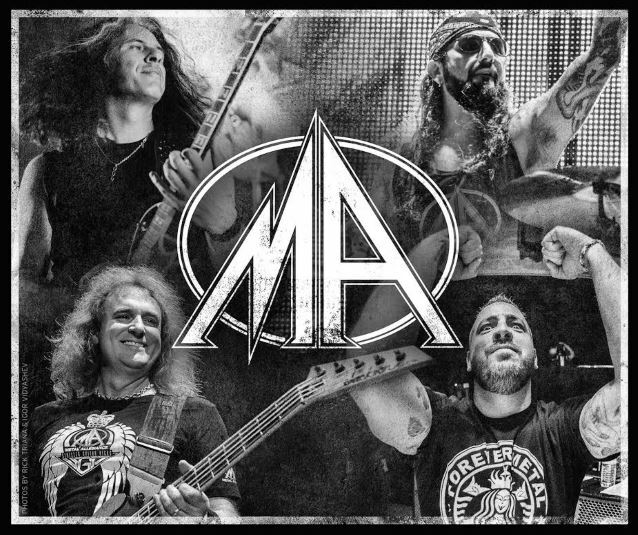 Since The Gathering and The Formation of Damnation, along those lines but perfecting the epic, more modern kind of metal while still having the old school thrash style. We wanted to keep topping and writing better songs I guess. As a fan of metal just really trying to write a song that I would like to listen to. It was very hard to put a tracking order together for this effort- all of the songs were pretty strong. Each song is kind of unique, even though there’s a lot more thrash- they all kind of have their own little trip. I’m very excited to see what the fans think of this material. Dead Rhetoric: Have theories of secret societies, aliens and the unknown always intrigued the band? Did you do some research in conveying the lyrical content through books, stories, movies, etc.? Peterson: Yes, it goes hand in hand with heavy metal. A lot of bands touch on these subjects, it’s just our unique interpretation of these areas. Definitely, especially with the title Brotherhood of the Snake – we couldn’t just write a bunch of songs and just pick some titles, I would say a little less than around half the songs are kind of together on that subject. We didn’t just want to pretend about what we were discussing, we did a little bit of research on this. 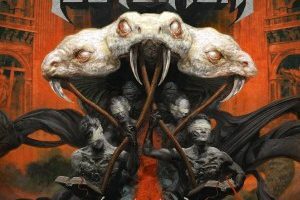 Dead Rhetoric: The cover art is striking – is it a collaborative process between the band and artist? Peterson: Yes, we work a lot with Eliran Kantor the artist. On the last couple of albums I gave him the biggest picture of what it’s going to look like, on this one I gave him a sketch. He came up with the whole idea and we added to it once he had these humanoid figures with the double meanings of the hydra snake. There are a lot of little things that we added to it to make things striking and cool. The average person wouldn’t notice these things until later when they get the album cover and start listening to the music, they’ll notice things tie in with the lyrics. Dead Rhetoric: Were there any particular songs that went through a big transformation from the initial idea to the final recording? Peterson: “Seven Seals” was definitely one of those ones. It started one way and ended up a different way. Like all the songs were pre-written with the drums and everything before I turned it in to everyone to teach them how to play them. That one was edited a lot in the recording process thanks to Pro Tools. It’s the same thing as rehearsing it and editing it, let’s try this and that. We didn’t have the time to do that, so luckily with technology you can cut and paste stuff which is pretty cool. 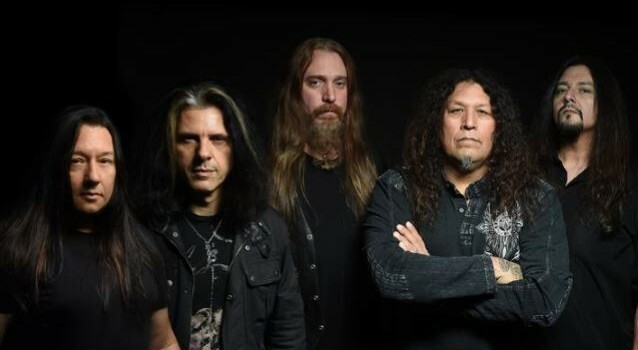 Dead Rhetoric: Do you feel like even as thrash was struggling to maintain a presence on the scene in the mid to late 1990’s, Testament was always a band to stay the course while keeping up with the times? Peterson: Yeah, definitely. We’ve always stood our ground, and we definitely take our time now. Not so much for not having enough ideas but we tour a lot more than we used to. I think bands need to do that, especially metal bands and bands that are not radio-friendly need to stay out there and tour to get their music across to the people. It’s just a lot harder because there are so many more options in music. When we first started you could probably count on both hands how many bands there were in your genre. Now that’s multiplied by the hundreds if not thousands out there- and a lot of them are really good, so there’s a really wide choice out there for people of music to listen to. Dead Rhetoric: What’s your stance on the art of live performance today – as many bands seem to employ many backing tracks these days to replicate their studio sound instead of keeping things more raw and real? Peterson: In Testament we like to keep things pretty real- that’s why we have good shows and bad shows. We are consistent once we get out on tour but we definitely don’t play to a click and we don’t have any backing tracks live. It’s all what we are doing up there, the five people up there on stage playing the music. It’s something we actually looked into but didn’t work out for us- it felt generic. Maybe with our luck a loop would go off and something would happen and the song would start before we were ready to play, or someone wouldn’t get to the microphone in time. We just didn’t want to look retarded doing that, we’ve seen other bands do that and think that’s really stupid. Dead Rhetoric: How do you feel about being a legacy thrash band to a second and third generation of musicians? What sorts of advice do you impart to the younger generation? Peterson: Things are a lot different than when we started out. Technology has really entitled a lot of players. It was a lot harder when we started. It’s kind of like one of those old sayings, my grandparents used to tell me that they had to walk a mile in the snow to get to school. Now kids get dropped off in their suburbans and they have their smart phones. It’s just a lot easier to do music I guess is what I’m saying. So for me to give any advice… the most important thing I would say is to really practice a lot and be yourself. Play what you feel like playing, and hone in your skills. Don’t try to copy exactly what you are being influenced by, try to make things your own. Dead Rhetoric: Has it been a challenge to adapt to the changing business model of music delivery and consumption? Peterson: I think we are all still adapting. We are at a point where everybody in the music business is kind of like how do we get back to getting our music across without it being free- and how do we get it to where… it’s really hard for bands. There are still bands that can be a phenomenon where they will sell, but most bands that were selling a million records are now down to selling 100,000-200,000. It’s because of getting free music from the internet, or pirating. Something will come along and I am sure the industry will figure out a legitimate way to do things. There are a lot of different ideas and some cool stuff in the pipeline. Dead Rhetoric: What is the game plan for worldwide touring and promotion over the next 12 months? Peterson: We are going to be exactly doing that, playing all over the world. We are starting off in late October in Europe, we are doing a cool run with Amon Amarth right on top of the release of our record. That will bring us into December which we’ll probably have off. I know in February we are playing 70,000 Tons of Metal. In between all of that stuff we are trying to get to Asia and Australia tentatively right now. In the springtime we are going to be doing a North American tour, we haven’t done a tour there for a long time. We are doing a co-headlining tour, I don’t know if we can announce it yet but it will be another cool band equal to us and they will have a new record- plus a couple of support bands so we’ll be going out with 3-4 bands. Then in the summer we are going to try to focus on doing festivals in the states- as we are always going over to Europe at that time but I know there are some popping up here, so we will be going back and forth between those two areas. Which will lead us into the fall, where we will probably be heading into South America. Then we’ll see what happens. Also, next year is our 30th anniversary so we have some plans for that. Maybe the end of summer or the fall, we’ll do something with that- whether it’s retail or touring, something different with a set. We are still trying to put that all together.